CLEVELAND (AP) — Hue Jackson is finally handing off his Browns offense. Cleveland’s coach, who has handled game-planning and play-calling duties while going 1-31 over two seasons with the Browns, is hiring former Pittsburgh offensive coordinator Todd Haley. Jackson interviewed other quality candidates but chose Haley, who spent six seasons guiding Pittsburgh’s high-powered offense before he was fired following a playoff loss last week, a person familiar with the negotiations told the Associated Press on Monday night. The person spoke on condition of anonymity because the team has not announced the move. A former head coach with Kansas City, Haley’s familiarity with the AFC North will be a huge plus for Jackson as he tries to turn around the Browns following a historic 0-16 season. The 50-year-old Haley worked in Pittsburgh with some of the NFL’s best offensive players — quarterback Ben Roethlisberger, running back Le’Veon Bell and wide receiver Antonio Brown. The trio made the Steelers a challenge for any defense, and the team ranked in the Top 10 in scoring in each of the past four seasons. The Steelers averaged 25.4 points per game last season while the Browns managed a league-low 14.6. Haley will inherit an offense in Cleveland with far less talent than he had in Pittsburgh, but the Browns are expected to upgrade their offense through free agency and in the draft. They’ll likely use either the No. 1 or No. 4 overall picks on a quarterback and could land Southern Cal’s Sam Darnold, UCLA’s Josh Rosen or Wyoming’s Josh Allen, the top three prospects. Haley became the fall guy after Steelers were bounced by Jacksonville in the AFC playoffs. 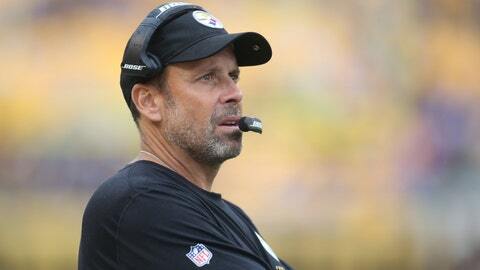 He was criticized for failing to have Roethlisberger sneak on two failed fourth-down plays. Haley called a wide pitch that lost yardage and Roethlisberger threw an incompletion on the second critical play as the Steelers were beaten 45-42 by the Jaguars, who advanced to the conference championship. Haley reportedly had a strained relationship with Roethlisberger, and that disconnect could have hastened the Steelers electing not to renew his contract. Haley went 19-27 and had one playoff appearance with the Chiefs, who fired him late in the 2011 season. Prior to that, he worked as Arizona’s offensive coordinator in 2007-08. The Cardinals scored a franchise-record 427 points in Haley’s second season.